“There do meet in Jesus Christ, infinite highness, and infinite condescension. Christ, as he is God, is infinitely great and high above all. He is higher than the kings of the earth; for he is King of Kings, and Lord of Lords. He is higher than the heavens, and higher than the highest angels of heaven. So great is he, that all men, all kings and princes, are as worms of the dust before him, all nations are as the drop of the bucket, and the light dust of the balance; yea, and angels themselves are as nothing before him. He is so high, that he is infinitely above any need of us; above our reach, that we cannot be profitable to him, and above our conceptions, that we cannot comprehend him. Proverbs 30:4, “What is his name, and what is his Son’s name, if thou canst tell?” Our understandings, if we stretch them never so far, can’t reach up to his divine glory. Job 11:8, “It is high as heaven, what canst thou do?” Christ is the Creator, and great possessor of heaven and earth: he is sovereign lord of all: he rules over the whole universe, and doth whatsoever pleaseth him: his knowledge is without bound: his wisdom is perfect, and what none can circumvent: his power is infinite, and none can resist him: his riches are immense and inexhaustible: his majesty is infinitely awful. And yet he is one of infinite condescension. None are so low, or inferior, but Christ’s condescension is sufficient to take a gracious notice of them. He condescends not only to the angels, humbling himself to behold the things that are done in heaven, but he also condescends to such poor creatures as men; and that not only so as to take notice of princes and great men, but of those that are of meanest rank and degree, “the poor of the world” (James 2:5). Such as are commonly despised by their fellow creatures, Christ don’t despise. 1 Corinthians 1:28, “Base things of the world, and things that are despised, hath God chosen.” Christ condescends to take notice of beggars (Luke 16:22) and of servants, and people of the most despised nations: in Christ Jesus is neither “Barbarian, Scythian, bond, nor free” (Colossians 3:11). He that is thus high, condescends to take a gracious notice of little children. Matthew 19:14, “Suffer little children to come unto me.” Yea, which is much more, his condescension is sufficient to take a gracious notice of the most unworthy, sinful creatures, those that have no good deservings, and those that have infinite ill deservings. 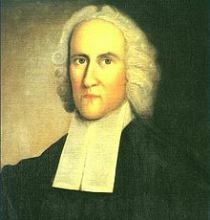 I am currently working through Jonathan Edwards’ (1703-1758) A History of the Work of Redemption – a book I should have already read a long time ago – and finding it a delightful read. Originally a series of 30 lecture-sermons preached to his congregation at Northampton, Massachusetts, in 1739, these sermons were later edited to take the form of a coherent treatise, and this is the form in which we find the work under its present title. “The next thing I would like to observe, is God’s remarkably preserving the family of which Christ was to proceed from perishing by famine by the instrumentality of Joseph. When there was seven years’ famine approaching, God was pleased, by a wonderful providence, to send Joseph into Egypt, there to provide for and feed Jacob and his family, and to keep the holy seed alive, which otherwise would have perished. Joseph was sent to Egypt for that end, as he observes (Gen. 50:20): ‘But as for you, ye thought evil against me; but God meant it unto good, to save much people alive.’ How often had this holy root that had the future branch of righteousness, the glorious Redeemer, in it been in danger of being destroyed! But God wonderfully preserved it. 1. It was perfect with a sinless perfection, and so exceeds all fallen men’s obedience. 2. It was perfect with a legal perfection. It was a finished righteousness, Christ continuing perfectly obedient to the end of the time of his probation, and so it exceeded Adam’s righteousness, that he had before the fall. 3. It was a person infinitely worthy, and infinitely valued and loved of God that obeyed. 4. The works or acts [that] was required of him by the law that he was under, and that he performed, were superlatively excellent, for it was a work of the highest love to God and love to creatures, and he in this work exercised a love to both immensely excelling all others, which gave an exceeding value to the work in the eyes of the Father. 5. It was a perfectly free gift to God, and not a debt; that is, it was not what he owed in his original circumstances. 6. Never was there so great and difficult a work required of any other, as Christ performed in obedience to God. It is God’s revealed will for all Christians to excel in the knowledge of divine things. God hath in the Scriptures plainly revealed it to be his will, that all Christians should diligently endeavor to excel in the knowledge of divine things. It is the revealed will of God, that Christians should not only have some knowledge of things of this nature, but that they should be enriched with all knowledge. 1 Corinthians 1:4-05, “I thank my God always on your behalf, for the grace of God that is given you by Jesus Christ; that in every thing ye are enriched by him, in all utterance, and in all knowledge.” So the Apostle earnestly prayed, that the Christian Philippians might abound more and more, not only in love, but in Christian knowledge. Philippians 1:9, “And this I pray, that your love may abound yet more and more in knowledge, and in all judgment.” So the apostle Peter advises to “give all diligence to add to faith virtue, and to virtue knowledge” (2 Peter 1:5). And the apostle Paul, in the next chapter to that wherein is the text, counsels the Christian Hebrews, leaving the first principles of the doctrine of Christ, to go on to perfection. He would by no means have them always to rest only in those fundamental doctrines of repentance, and faith, and the resurrection from the dead, and the eternal judgment, in which they were indoctrinated when they were first baptized, and had the Apostle’s hands laid on them, at their first initiation in Christianity. God has appointed teachers to help us grow in knowledge of divinity. It may be argued from this, that God hath appointed an order of men for this end, to assist persons in gaining knowledge in these things. He hath appointed them to be teachers. 1 Corinthians 12:28, “And God hath set some in the church, first apostles, secondarily prophets, thirdly teachers.” Ephesians 4:11-12, “He gave some, apostles; some, prophets; some, evangelists; some, pastors and teachers; for the perfecting of the saints, for the work of the ministry, for the edifying of the body of Christ.” If God hath set them to be teachers, making that their business, then he hath made it their business to impart knowledge. But what kind of knowledge? Not the knowledge of philosophy, or of human laws, or of mechanical arts, but of divinity. If God have made it the business of some to be teachers, it will follow, that he hath made it the business of others to be learners; for teachers and learners are correlates, one of which was never intended to be without the other. God hath never made it the duty of some to take pains to teach those who are not obliged to take pains to learn. He hath not commanded ministers to spend themselves, in order to impart knowledge to those who are not obliged to apply themselves to receive it. The name by which Christians are commonly called in the New Testament is disciples, the signification of which word is scholars or learners. All Christians are put into the school of Christ, where their business is to learn, or receive knowledge from Christ, their common master and teacher, and from those inferior teachers appointed by him to instruct in his name.